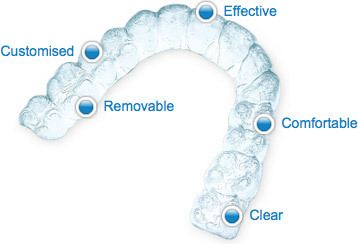 Invisalign consists of a set of small, all but invisible aligners manufactured from ultra-lightweight clear plastic. Custom made in a specialised laboratory and fitted at one of our Perfect Smile clinics, the aligners gradually and painlessly shift the position of your teeth. Once one set of aligners has done their job, they’re replaced by the next set and all the while the movement of the teeth is gradual but noticeable, until they’re in exactly the right position. Unlike cumbersome metal braces, Invisalign aligners won’t cause painful inflammation of the gums or irritation of the soft tissue. Everybody wants the perfect smile, for the aesthetic appeal and boost in confidence it provides. The knowledge that your teeth are in tip-top condition can increase your self-esteem to a massive degree. Often, the final piece of the orthodontic jigsaw, the treatment which will set the seal on the smile you’ve always wanted, is alignment and the straightening of your teeth. Many people shy away from taking this final step, however, because they fear it will mean they have to wear braces. There are many reasons why people might wish to avoid braces, the foremost being, purely and simply, the way they look. No matter what your job, position or role in life, it’s not an appealing thought to have to walk around with bulky, unsightly pieces of metal attached to your teeth. Not only do traditional braces look unpleasant, but they frequently feel uncomfortable and can have a detrimental effect on your speech patterns. Invisalign is the answer to this conundrum. A teeth straightening treatment which is totally effective yet all but invisible, allowing you to work towards your perfect smile whilst getting on with your life.